"Scott Smith, carefully and consciously, with philosophical rigor and clarity of word, offers a defense of moral knowledge that is tightly tethered to more ancient, and Christian, understandings of the good, the true and the beautiful. The result is a compelling case for why philosophical naturalism, including its cousin, nominalism, must be rejected by anyone who sincerely seeks after moral knowledge. Smith's greatest accomplishment in this book, however, is the way in which he interacts, at a high level, with contemporary philosophical schools of thought and ancient traditions in a way fully accessible to the educated layman and college student." "While ancient and medieval philosophy agrees with Scripture that moral knowledge is possible, the fallout of both modernism and postmodernism is a debilitating moral skepticism. Against this, Smith shows these worldviews to be self-defeating, and defends an ontology of embodied souls and moral essences grounded in God, which rehabilitates the idea of moral knowledge. Anyone dismayed by our culture's creeping nihilism will be encouraged by this important, insightful and timely study." "Building on arguments advanced in his two earlier books, R. Scott Smith makes a powerful, carefully reasoned case for real knowledge of the world, moral values and principles. Along the way he presents an insightful history of Western ethics designed to show the many ways in which ethics has gone wrong, especially in separating itself from factual moral knowledge, resulting in today's relativistic approach to knowledge in general and to moral knowledge in particular. Arguing further that moral knowledge cannot be grounded in any form of naturalistic metaphysics, Smith contends that objective moral values (virtues) and principles (duties) must be transcendentally grounded in the character of God, specifically the God of biblical revelation, finally the God of Christianity. Smith writes precisely and persuasively but not dogmatically, and clearly invites and often articulates counterarguments at every turn. The book sets the standard for anyone who is drawn to affirm a universal ethic grounded in the character of God." "Scott Smith has done an admirable job of surveying the ethical landscape both past and present. And he both challenges various forms of relativism and naturalism that are so corrosive to moral knowledge and quite effectively dismantles the commonly assumed arguments for the fact-value split. Also, he carefully constructs a case for the foundations of moral knowledge. In doing so, he offers much-needed wise guidance in an era that increasingly calls such knowledge into question." "R. Scott Smith's In Search of Moral Knowledge brilliantly argues that objective moral knowledge is possible and that this kind of knowledge is grounded in the character of the Christian God. This bold assertion runs counter to much of what is widely accepted in contemporary ethical scholarship. But Smith is undaunted. He meticulously explores origins of contemporary relativistic ethical theories (in which the so-called 'fact-value split' is fundamental), and he claims that these theories simply cannot stand up to close philosophical scrutiny. 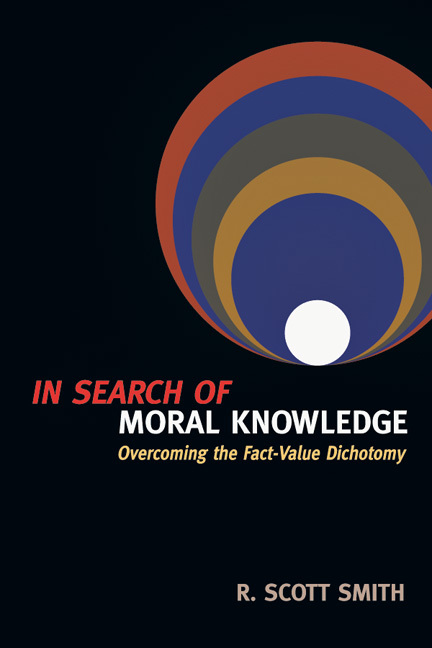 In Search of Moral Knowledge will be used by ethical theorists and students for a long time. Smith builds on a deep knowledge of the history of ethical thought. But his straightforward writing style assures that his arguments will be accessible to people who are just beginning to reflect seriously on their own moral experience." "Over the years, Scott Smith has, time and time again, demonstrated deep insight into the underlying causes of our contemporary cultural chaos. In In Search of Moral Knowledge, he has, once again, put his finger on the pulse of the fount of society's moral ills. Smith rightly points out that moral knowledge, and not merely moral belief, is what is needed to live a proper life and form a virtuous society. And he locates the denial of moral knowledge in the views of reality promoted by various extant lines of thought. This is no mere ethics text, examining moral issue after moral issue. This is one of the few books by an evangelical that lays bare the underlying metaphysics and epistemology that generate the various streams of moral thinking today. This should be a text in any ethics class, and I wish for it a wide distribution." "Scott Smith has produced a powerful new tool for Christian moral apologetics. He clarifies the veracity and strength of received moral wisdom both Christian and classical. He exposes the self-defeating vacuous nature of contemporary moral illusions. And he defends the objective reality of known moral truth grounded in the one true God and accessible to all bearing the imago Dei regardless of culture, feeling or locality. I will use this book with my students and urge others do the same." "Smith definitely contributes to the discussion of the merits of realism (that is, the legitimacy of exploring dualism), of overcoming the fact-value divide (that is, ethics is grounded in reality), and of critiquing the unwarranted dominance of naturalism (that is, it cannot fully account for knowledge). For these reasons, Smith's book should be read." 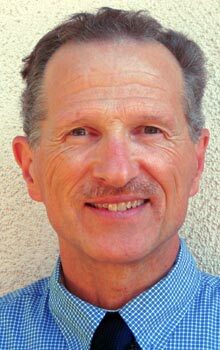 R. Scott Smith (PhD, University of Southern California) is associate professor of ethics and Christian apologetics at Biola University. He is the author of Virtue Ethics and Moral Knowledge: Philosophy of Language After MacIntyre and Hauerwas, Truth and the New Kind of Christian, and Naturalism and our Knowledge of Reality.